One of the easiest trips anywhere. We have many species from around the world all in South Florida. Other species outside of the well known peacock bass and largemouth bass we can target here in Florida are Southern Snakeheads, Jaguar Gaupote's. Oscars, Midas Cichlids, Mayan Cichlids, Banded Cichlids, Blackbelt Cichlids along with some saltwater species such as Snook, Tarpon, Jack Crevelle and Bigmouth Sleepers. You can fly-in during the morning, fish the day and get dropped back off to the airport for a flight home from Miami or Ft. Lauderdale. Pick ups from a local hotel can be arranged as well if you elect to stay overnight, make it part of a vacation or all of your vacation. We adjust! A typical fishing day runs from 6:30 AM. until noon time or 4:00 PM depending on a half day or full day trip. 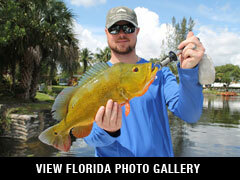 Anglers are paired one, two or three to a boat with Alan or an experienced Florida guide. You maybe fishing from narrow-hulled 16-foot gheenoe or a 20' Sea Chaser flats boat or a normal bass boat starting with a 25 h.p. outboard up to a 250 hp motor. This allows us to adjust to conditions and species of fish that are desired. We supply all equipment and tackle (spin, baitcasting) or you can bring your own. If you need to use our fly tackle we will need to know ahead of time as this gear breaks very easy and we do not keep on boat at all times. Live bait is extra. Half days start at $350.00 for one person / Full days start at $500.00 for one or two people. $50 charge per extra angler over two people. Package prices can be put together. $100.00 per day. May be paid with check, credit card, certified check or money order. Final payments are typically due at the end of fishing day. Paying by credit card will have a 3 percent charge for handling. Tips, gifts or items of a personal nature. Daytime temperatures typically range from 60-95 degrees during the day. Heavy tropical downpours can occur even during the "dry season" so be sure to pack a rainsuit.